Thank you to the NLC staff and community members who donated blood at our NLC Red Cross Blood drive yesterday. Also a big thank you to the CATS student group for helping organize the event. We exceeded our goal!!! NLC students who received All A's for the third qtr enjoy a free pizza reward at Pizza Ranch today. Way to go! Please contact the NLC Elem office at 481-2086 and ask for Mrs. Landgren if you would like to schedule a time to donate. Board Recognition - Last night the board recognized our 7th Gr Quiz Bowl League Champions and 2 young ladies (Dani McElfresh and Kami Miller) for the amazing job they did as first responders to a teacher who needed medical attention. So very proud ❤️! District Facilities Survey. Please follow this link​ to complete the survey asking for your input on the facility needs of the district. There is space for additional comments. The survey is completely anonymous. https://www.surveymonkey.com/r/USD251ResidentSurvey2018. Help Your Child Succeed: Every month, practical ideas to promote academic success, effective parenting, a solid home-and-school partnership, healthy habits, and positive character traits. The October 2018 issues are now available: http://www.usd251.org/o/district/browse/20750. 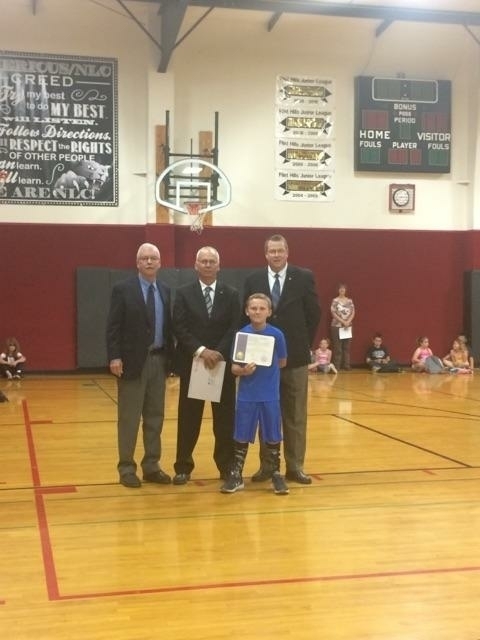 NLC is so very proud of 6th grader Boston Eckstrom as he was nominated and won the Masonic Exemplary Student Award which was presented by several Mason's at our morning assembly. He exudes so many of the character traits we teach and say in our Creed! Way to go Boston! Americus Kindergarten students made Community Helper Flipbooks when discussing careers with Mrs. Landgren. They had fun talking about what they could do when they grow up! Keep sending in your recipes for our school cookbook! All Reading and Americus students are encouraged to participate! We will continue to accept recipes all next week. The junior high students at NLC received important information about the proper use of cell phones from the Lyon County Multi-Disciplinary Team. Thank you to the presenters for taking the time to educate our students on this crucial topic. Students at Americus Elementary were recognized last week at an assembly for showing perseverance and effort in academics. Congratulations students! Just a tease as the Americus Spring Concert is next week! Check Facebook for video! See you Thursday, May 3rd at 6:30pm! Reading School Carnival is tomorrow. Free games begin at 5:00 and the pulled pork/hotdog meals begin at 4:45. There will be a small silent auction. We hope to see you at the carnival! Mrs. Breiner's MTSS Class from Northern Heights High School has been researching Distinguished Alumni. They started with our NHHS Staff Members who graduated from NHHS and are currently on staff at their alma mater. Go Wildcats!!! “Northern Heights High School Distinguished Alumni”	(compliments of Mrs. Breiner’s MTSS Class) We are proud to recognize NHHS staff members who graduated from NHHS and are currently on staff at their alma mater. Go Wildcats!! Sophie Arens placed third in Serious Solo Acting at the Flint Hills League Forensics meet in Lyndon! Congrats Sophie! NLC and NHHS Marching Band are scheduled to arrive home at NHHS at 12:30pm this Saturday. It would be great to have a WELCOME BACK group waiting to let them know just how proud we are of them! Stay tuned to facebook for updates should be time change. Proud of senior drum major Karsen DeWeese and the rest of our NHHS seniors. They are providing great leadership for our students and school. Awesome job NHHS band. Proud to be a Wildcat! My be closer to 3pm (2pm cst) before the band gets to Main Street. Also, I'm hoping there is a good enough data signal to live stream! Fingers crossed! FYI...the band marches at 2:30 EST which is 1:30pm CST back home. We will upload the video after the kids march! Fun day a Hollywood Studios today! Band marches tomorrow at Magic Kingdom! State Assessment Assembly at Americus/NLC today to get students excited for testing which starts tomorrow! We made it to Orlando and the sun is shinning! It might not be sunny but it is still the ocean. A quick pit stop at Daytona Beach. I thought Flordia would be sunnier than this! 😉 Lunch stop in Columbia, MO. Snowing most of the way. Bring on the sun! Walt Disney World here we come! Thank you Mrs. Merring and Ms. Lukehart for all of your hard work and dedication to make this trip possible. Florida bound! NLC kids enjoy an afternoon of bowling as a reward for good 3rd qtr behavior! Thanks to Americus PTO for picking up the tab! Reading Character Champs for the week. OWEN DEDONDER for being a responsible student, working hard, contributing to class with great ideas, and being kind to new classmates. HUNTER SENFT for sharing your sense of humor and intense love and for learning new information through reading. LIBBY HENSLEE for working super hard on her academic skills and being a friend. GRACE BRUNMEIER for working hard on skills and great character. IZZY DIEKER for helping others with their computer skills and working hard on her work. We are very PROUD of Aubrey Hinrichs, 8th grader at NLC, who today was awarded the Eastern Kansas FCA (Fellowship of Christian Athletes) Student of the Month Award by Gary Larson, Director of East Kansas FCA. Way to go Aubrey! She exudes so many great character and service traits that we try to instill in our youth! 8th Graders enjoyed learning more about NHHS and participating in Reality U today. Americus Elementary Character Assembly was held last week. Students were recognized for Leadership and Responsibility as well as good effort in academics. Good job students! I'm in an inspirational quote mode this morning after listening to Dr. Watson. Kansas is on the right path for school redesign. 1) Personalized 2) Project Based 3) Intense focus on social and emotional development and 4) Immersion with parents and community. Dr. Watson (Kansas Commissioner of Education) just shared this quote this morning. Love it! Awesome turn out for Donuts with Dads! Thanks to @Hostess for their donut donation and to our NLC STUCO students for serving! Also to our teachers for helping their students honor their dad's with great projects. More pics on Facebook! Calling ALL Dads, Grandpas, Father Figures, and special guests! Americus Elementary and NLC Jr. High will be hosting Donuts for Dads Friday, March 2nd, 2018 @ 7:30 a.m. in the Americus School Gym. There will be a two hour late start for school tomorrow (Friday) to allow everyone the time to travel to school safely. Breakfast will not be served. Due to the current gravel road conditions and the forecasted precipitation throughout the night, USD 251 will not be in session tomorrow. The basketball game will be determined tomorrow based on weather conditions. NLC welcomed students from the NHHS FFA chapter so that they could talk with 7th and 8th graders about FFA and celebrate FFA week! Great job FFA guys and gals! The NHHS Basketball games have been rescheduled for Thursday evening. The games will begin at 4:45. The main gym will begin with JV Boys, followed by varsity girls, followed by varsity boys. The south gym will host 1/2 a game of JV girls and then a C boys game. Senior recognition will be between the varsity girl's and boy's game. GO WILDCATS!!!!! The Americus Book Fair will be open tonight 3:00-5:00pm and throughout Parent-Teacher Conferences tomorrow 1:00-8:00pm. Stop by and support our school library! Over $120 was raised in our pie face coin challenge where students voted with their coins to decide which Americus Elementary teacher and which Jr High teacher would get a pie in the face! Money will go to purchase books from the book fair that will then be donated to teachers for their classroom library. Thanks to Mrs. Heins and Mr. Baldwin for being such good sports as our winning teachers! Americus lower elementary classes celebrated the 100th day of school with numerous activities designed to get them excited about applying their skills in counting and math. Hard to believe we have 100 days behind us already! New York Times best selling author Laura Moriarty talked with Northern Heights High School students from Mr. Becker's English class about her new book. Mr. Becker and his English class have been attending author book talks all year. Mr. Becker has also had many authors visit his English Class this year. 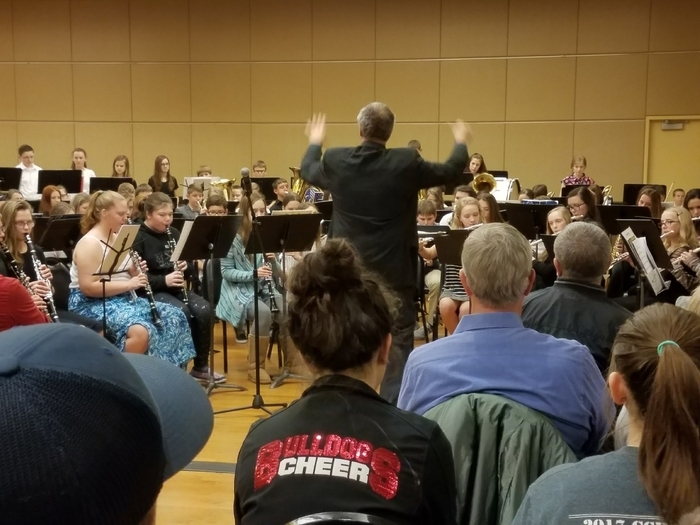 Our NLC band rockin with other league school bands at the FHJL Band Concert in ESU's Webb Hall. What an awesome opportunity! Tomorrow is the last day for the Americus Coin Drive. Bring in your spare change and vote for the teacher you want to get a pie in the face! All money will be used to purchase books for classrooms. Congrats to our 251 Lyon County Spelling Bee participants! All 251 spellers made it through numerous rounds with Preston Patton placing 4th overall! Reading staff hosted an amazing Bee! Good luck USD 251 students Gus Phillips, Rachael Coppock, Tagen Hoffer, Clayton Collier, Landon Dody, Matthew Rouse, Preston Patton, Heather Metcalfe, and Emily Maxwell in the Lyon County Spelling Bee! Week 2 NLC Quiz Bowl Results from the Lyndon Quiz Bowl: 8th: won 3 lost 4 7th: won 2 lost 5 Next week NLC hosts! Go NLC! KANSAS DAY CELEBRATION AT READING SCHOOL Reading Elementary celebrated Kansas Day by having an all school event. Students were dressed in different ways that represented Kansas. We had pioneers, cowboys, K-State/KU fans, a honey-bee, and an ornate box-turtle to name a few. The morning started off with some history of how the land was settled. Students enjoyed singing around a campfire (artificial of course) and imagining what life was like back then. Then we broke up into multi-age groups and enjoyed various stations that included butter-making and whole-wheat pancakes and honey, old-time games (jacks, whirly-gigs, and cat’s cradle), sunflower art, artifacts (small scaled covered wagon and arrowheads), and bird-house making. In the afternoon, we enjoyed Kansas animal artifacts from the Emporia Zoo and a presentation of some tools that were used in the early days. We concluded our day watching the movie “The Wizard of Oz” while enjoying sunflower seeds. The students said they really enjoyed the day and learned more about our great State of Kansas! Don't forget to RSVP by WeDnEsDaY for the Americus Book Fair Family Breakfast next Tuesday, February 13th at 7:30-8:00 am. Adult breakfast costs $2.05. If you don't have a form please call of email. Mrs. DeLong has gotten a quick lead for the Jr. High on Day 1 of the Pie Face Coin Challenge! Bring your change tomorrow and vote for the teacher you want to see get a pie in the face! The Americus Elem./NLC Jr. High will begin their All for Books Coin Drive tomorrow. Money can be put in the jar of the teacher they want to see get a pie in the face. All money donated will go to buy books for our classroom teachers. Proud of our NHHS students, Kennedy Dragonas and Kylee Sull, who represented USD 251 at the State Wellness and Nutrition workshop in Topeka today. Thank you ladies! 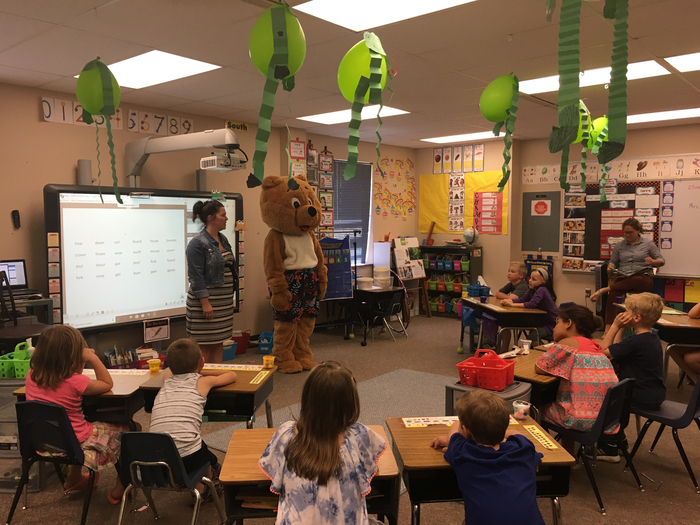 Reading Kindergarten/First Grade are going to be radio stars! Chuck Samples from KVOE called to interview us about our Smile Sticks’ project. We are so excited You can listen to us on KVOE on Friday, February 2, at 7:15 AM, 12:20 PM, and 5:20 PM. It will be on the radio station’s website after the 12:20 broadcast.